Osmosis: Metabolic alkalosis. (2019, April 20). Retrieved from (https://www.osmosis.org/learn/Metabolic_alkalosis). Metabolic alkalosis, a disorder that elevates the serum bicarbonate, can result from several mechanisms: intracellular shift of hydrogen ions, gastrointestinal loss of hydrogen ions, excessive renal hydrogen ion loss, administration and retention of bicarbonate ions, or volume contraction around a constant amount of extracellular bicarbonate (contraction alkalosis). is a diuretic used to alkalinize the urine or treat metabolic alkalosis as it inhibits carbonic anhydrase. A 20-year-old man comes to the clinic because of muscle cramps and fatigue for the past year. He has experienced muscle cramps his entire life, but they have now become more frequent and painful. He has always awoken several times per night to urinate. His medical history includes chronic mild hypokalemia and hypomagnesemia. Family history is significant for similar symptoms in one of his four older sisters. He takes no medications. His temperature is 37.0°C (98.6°F), pulse is 76/min, respirations are 14/min, and blood pressure is 126/78 mm Hg. Physical examination shows a tired-appearing male with no other abnormalities. In addition to his chronic electrolyte deficits, laboratory studies show a mild metabolic alkalosis. Which of the following is the most likely diagnosis? In metabolic alkalosis, the blood pH is above 7.45, and it’s due to a bicarbonate or HCO3 concentration in the blood over 27 mEq/L. Individuals with metabolic alkalosis can be asymptomatic or can cause hypoventilation, due to respiratory compensation. Associated symptoms are related to the underlying cause. For example, if there’s a history of vomiting, nasogastric suction, laxative abuse or use of loop or thiazide diuretics, then there may be symptoms of dehydration. The diagnosis is usually based on an ABG, and in addition to a pH above 7.45, and HCO3 levels above 27 mEq/L, if there’s respiratory compensation, the pCO2 is usually above 45 mm Hg. Generally, for every 1 mEq/L elevation in HCO3 above the normal level of 27 mEq/L, pCO2 increases by about 0.7 mm Hg above the normal level of 45 mm Hg, but pCO2 doesn’t usually rise above 55 mm Hg, regardless of HCO3 levels. Let’s take an example and say that HCO3 level is 30 mm Hg- so it’s 3 mEq/L above the baseline. This means that our pCO2 should be 45- which is the baseline for pCO2- plus 3 times 0.7, which equals 47.1 mm Hg. In addition, electrolytes are also done to see if there’s any imbalances, like hypokalemia. Now, if the cause of metabolic alkalosis isn’t obvious from the history, then a spot urine chloride is measured. If the urine chloride is below 20 mEq/L, that suggests volume depletion from a variety of causes like vomiting which leads to loss of hydrochloric acid, so the treatment is really aimed at addressing the underlying cause of vomiting. A related cause is aggressive nasogastric suction, so the treatment is stopping or slowing the removal of gastric secretions. Another cause is loop or thiazide diuretics which block hydrogen ion and chloride ion reabsorption in the kidney. Chloride is a negatively charged ion, so loss of chloride leads to increased reabsorption of bicarbonate to compensate for the loss. The loss of chloride causes the urine chloride to go above 20 mEq/L, and a lot of hydrogen is lost-leading to metabolic alkalosis. Once the medication starts to wear off the diuretic effect dissipates, so the urine chloride falls below 20 mEq/L, but because the hydrogen ions were lost, there’s still a metabolic alkalosis. Treatment relies on stopping the use of loop or thiazide diuretics. Finally, a rare cause of metabolic alkalosis is diarrhea. 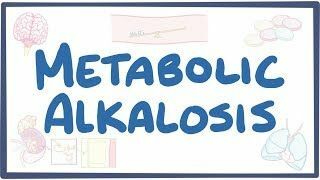 Now diarrhea typically causes metabolic acidosis due to loss of HCO3, but some causes of diarrhea can lead to a metabolic alkalosis. These include diarrhea due to laxative abuse which causes chloride to be lost in the GI tract, a villous adenoma which secretes chloride into the lumen of the gut, or diarrhea due congenital chloridorrhea, which is a genetic condition that causes chronic, chloride-rich diarrhea. In short, all of these types of diarrhea lead to chloride losses in the GI tract. Again, treatment really depends on the underlying cause. And in addition, individuals that are hypovolemic are given IV isotonic saline- which helps reverse metabolic alkalosis by correcting the chloride deficit . Now, sometimes, individuals with heart failure or cirrhosis develop metabolic alkalosis, because they’re intravascularly volume depleted from diuretic therapy, but they have peripheral edema and ascites. In this case, oral potassium chloride is usually given with a oral potassium-sparing diuretic - like Spironolactone. If this doesn’t correct the alkalosis, then acetazolamide is given because it’s a diuretic that specifically increases bicarbonate excretion. When urine chloride is above 20 mEq/L, this means that too much chloride is being lost through the urine. One cause of this is primary hyperaldosteronism or Conn’s syndrome- which is an aldosterone-producing benign adenoma in the adrenal glands. Hyperaldosteronism leads to increased sodium bicarbonate reabsorption in the proximal tubule and increased excretion of potassium and hydrogen, which leads to a metabolic alkalosis. The increased reabsorption of sodium and excretion of potassium also leads to hypertension and hypokalemia. In this case IV isotonic saline won’t be effective in reversing the metabolic alkalosis, because chloride will still be excreted in the urine. Treatment relies on surgically removing the adenoma. When there’s also hypokalemia, oral potassium chloride is given when potassium levels are between 3 and 3.5 mEq/L, and IV potassium chloride is given when potassium levels are below 3 mEq/L.